Bon Appétempt: bon appétempt going savory or "roasting a chicken is sooooooo easy"
bon appétempt going savory or "roasting a chicken is sooooooo easy"
First step outside of my comfort zone: I had to take a trip to THE BUTCHER ... after some friendly meat-based conversation, he and I decided on a 5 pound organic bird. I wanted to cook it in my sweet le creuset pot my brother got me for my birthday, but as it turns out, it was too cute and too little. This is where my husband, Matt, began saying things like, "Time to get bon appetempt with it." Ever rub butter underneath skin? It's weird. VERY weird. OH and also, I don't have one of those instant-read thermometers you're supposed to put in the bird's leg. We just pulled it out a few times and cut into it in places and then took a vote on whether or not we thought it was ready. And what do you know? Two hours later, it wasn't overdone or underdone. Here she is, again--poor lil' guy. The potatoes and carrots and parsnips and yams were perfect. And I hate to say it, but all in all, this meal was fairly easy (and would be even easier with a roasting pan) and with plenty of leftovers. And when I say leftovers, I'm talking about chicken carcass, which I'm currently and proudly simmering for chicken stock. That bird cost you $17? Yummy! Just the other day, Adam and I were at a small farmer's market (in a MALL, no less) and one of the farms was selling whole chickens. I convinced Adam not to get it because it would be "too much trouble." I hope he doesn't see this blog and go bon appete-anger on me!!! 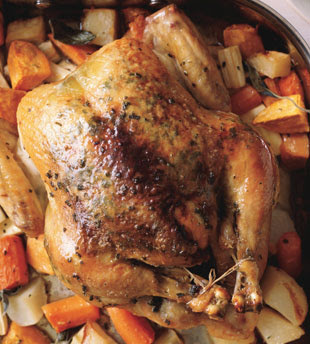 Roasting a chicken was one of my first kitchen hurdles to overcome. Glad to see yours was a success! I love roasting chix! yummy yummy! Roasted chicken is my specialty. I have been perfecting it since I was 16. If and when we make it back to LA, I will show you my secrets! ;) In the meantime, let me just say that next time, you should flip the little guy over and roast him belly-up. Makes the dark meat all that much more juicy! YUUUUUUMMMMMM.